3 style in 1 bag (shoulder, clutch, purse) handbag, patent leather clutch is sure to impress. Magnetic-flap closure. Inside polyester lining with one small pocket. Inside can easily fit a cell phone, wallet, compact mirror, lip gloss, and a pack of gum. Conveniently, you can spend the night hands free with the detachable silver chain that is included. 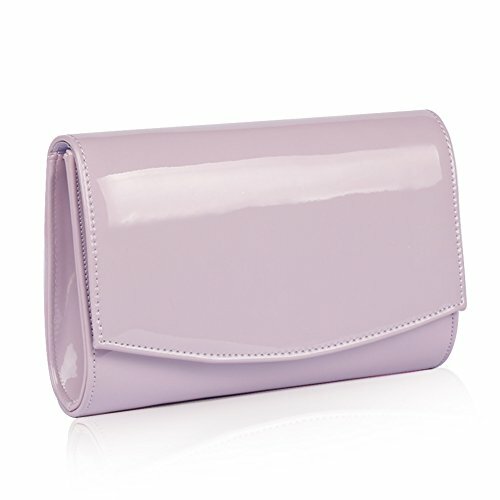 Magnetic snap closure,made from high quality PU leather and a slip pocket with a fully lined interior. With O-shaped chain strap provides different looks as a clutch, a shoulder bag or a crossbody bag (O-shaped chain wouldn't caught or pulled hair or dress) . If you have any questions about this product by WALLYN'S, contact us by completing and submitting the form below. If you are looking for a specif part number, please include it with your message.